The following families have genealogy eBooks on this page: Baer, Brubacher, Burroughs, Current & Hobson, Donald, French, Gillson & Jillson, Goding, Jaquett, Mower, Richardson, Soverhill, Spencer, Surdam, Thompson, and Tracy. Welcome to Bookshelf 8 at Hawkeyes Trading Post! Baer Family History and Genealogy or Genealogy of Johannes Baer. PDF eBook English 17.4 MB. 1910. Numerous rare family photographs, detailed pedigree charts, a map of the family farm area, and an index of over 2000 names are compiled in this extraordinary eBook! Among the detailed stories is the immigration in 1690 on the vessel Joyce, to the American colonies! Descendants with the name variation of Bare are also well referenced in this publication! Significant information with vital dates for family members from the year 1749 to 1910! 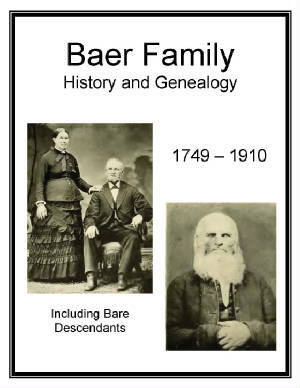 A marvelous resource for documenting Baer genealogy! Price $6.95 USD. 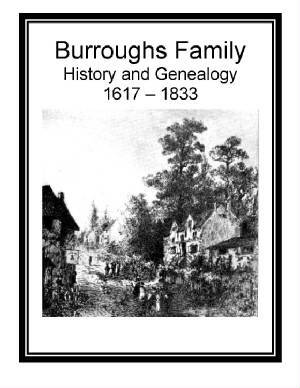 Burroughs Family History and Genealogy or Genealogy of the Burroughs Family. PDF eBook English 1.19 MB. 1894. Burroughs family members will want this eBook for the families connection to the renown historical events attached to Salem, Massachusetts and the surrounding region in 1692. Several Last Will and Testaments provide lineage confirmation, and the legend of the Burroughs family name from 1384 is also detailed. Documentation of family members over a 215 year period, from 1617 to 1833, provides significant information and dates for the family genealogist! Price $6.95 USD. 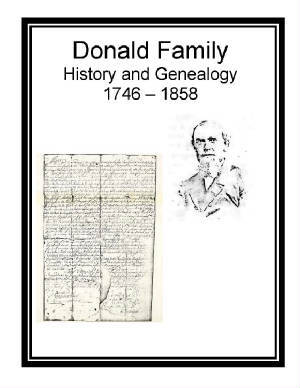 Donald Family History and Genealogy. PDF eBook English 3.91 MB. 1906. Written in a story book format, there are many tales of ancestral travels intertwined with the Scottish homeland. There are biographies, and a wide assortment of Scottish kindred in the pages of this enchanting eBook of the Donald Family! Poetry, handwritten letters (1732), a map, and immigration from Scotland to the U.S.A. in 1844 are documented. Documentation of family members from 1746 to 1858 provides significant information with dates! The ravages of time have taken its toll on the paper where etchings and photographs are somewhat faded with time. Still a wonderful resource for the family genealogist! Price $6.95 USD. Gillson and Jillson Families History and Genealogy. PDF eBook English 13.1 MB. 1876. 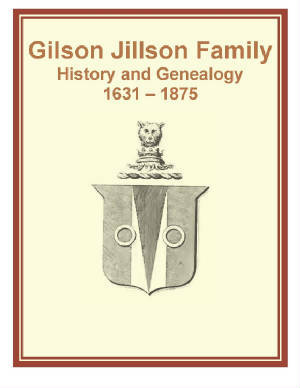 In this publication up to 8 generations of Gillson and Jillson family members are compiled, which cover the years from 1631 to 1875! A period of over 240 years! An index of over 750 descendants are listed which include allied in-law families! Extraordinary information for anyone in the Gillson or Jillson families! Price $6.95 USD. 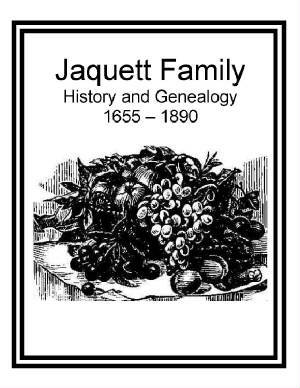 Jaquett Family History and Genealogy or Genealogy of the Jaquett Family. PDF eBook English 10.0 MB. 1896. A Huguenot family from Switzerland, with an ancestor that worked for the renown Dutch West Indies Company is detailed in this eBook. This publication contains letters, Last Will and Testaments, surveyors records, and tombstone inscriptions. Interesting short biographies are written on many descendants of the 7 generations of kindred listed, that are compiled for the period 1655 to 1890! 235 years! An essential resource for the family genealogist! Price $6.95 USD. Richardson Family History and Genealogy or Eleazer Richardson of Manchester and Bristol with his descendants. PDF eBook English 2.26 MB. 1913. 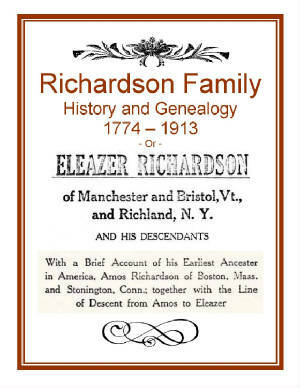 A fascinating narrative of Eleazer Richardson who migrated from Vermont to New York with a brief account of his earliest ancestor in America, Amos Richardson of Boston, Massachusetts and Stonington, Connecticut. The lineage is documented for nearly 140 years, and stretches from the year 1774 up to 1913! Excellent information for anyone of the Richardson family interested in family genealogy! Price $6.95 USD. 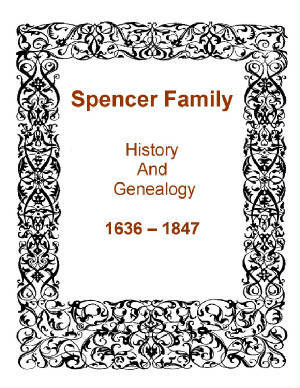 Spencer Family History and Genealogy. PDF eBook English 2.20 MB. 1889. The family lineage covers 8 generations from the year 1636 to 1847, with many Last Will and Testaments that confirm family relationships. A 6 page alphabetical index provides names of over 180 family members for this historical 200 year period! This reference may detangle relationships from past centuries! Price $6.95 USD. Thompson Family History and Genealogy or Andrew Thompson emigrant of Elsinborough, New Jersey and his descendants. PDF eBook English 2.80 MB. 1910. 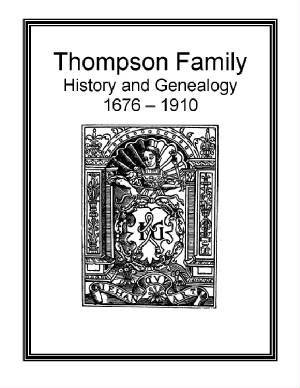 Over 230 years of compiled vital records on the Thompson family lineage, that span from 1676 up to 1910! The appendix lists several fascinating Last Will and Testaments’ written by Thompson ancestors from long ago. These provide a window to Thompson households of yesteryear, and a perfect source that confirms members of the family! A great link to the past for the family genealogist! Price $6.95 USD. 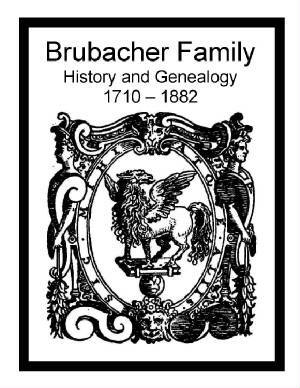 Brubacher Family History and Genealogy or The Brubacher Genealogy in America. PDF eBook English 7.55 MB. 1884. There are up to 8 generations of Brubacher ancestors listed, which stretch from 1710 to 1882, with over 100 descendants alphabetically indexed! The immigration from Switzerland to America is also described! A wonderful resource for the family genealogist! Price $6.95 USD. 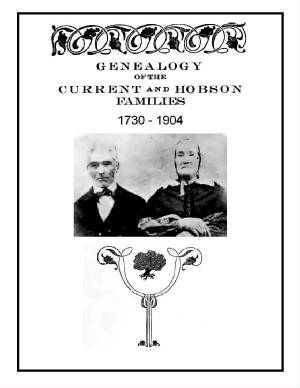 Current and Hobson Families History and Genealogy. PDF eBook English 19.0 MB. 1906. Numerous rare ancestral photographs are spread throughout this publication with detailed narratives on the pioneer times of the family forefathers! The statistical information on family descendants covers the years from 1730 to 1904, a period of over 170 years! A great resource for the family genealogist with a wealth of kindred information! Price $6.95 USD. French Family History and Genealogy of Genealogy of the French Family. PDF eBook English 828 KB. 1903. 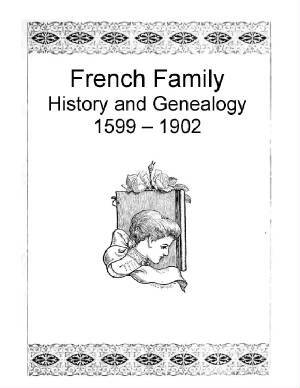 Documentation on the French family lineage extends for a period of over 300 years in this short and concise 11 page publication. The immigration from England to American in the year 1635 aboard the ship Defence is described. The ink was fading fast on the paper used in the old hard bound publication, but is very readable in this eBook. Vital dates are given from the year 1599 to 1902 for French family ancestors! A marvelous resource for documenting genealogy! Price $6.95 USD. 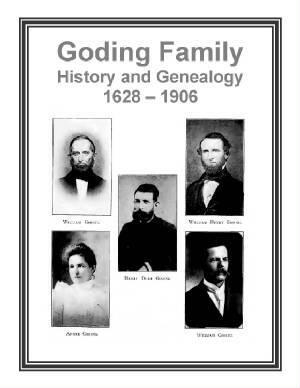 Goding Family History and Genealogy. PDF eBook English 12.3 MB. 1906. A fascinating story of Scandinavian mythology incorporated into the ancient name of Goding! The family Coat of Arms is pictured, 9 generations of family descendants covering a period of over 275 years, numerous rare ancestral photographs, and over 20 pages of alphabetically indexed names! Documentation on family kindred span the years from 1628 to 1906! An abundance of information for the family genealogist! Price $6.95 USD. 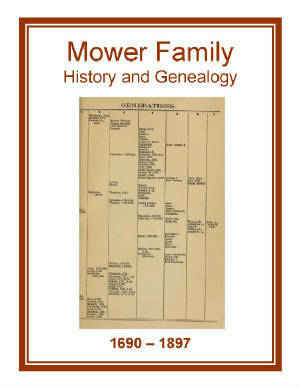 Mower Family History and Genealogy or Mower Genealogy. PDF eBook English 464 KB. 1897. There are 7 generations of descendants listed that cover a period of over 200 years, from 1690 to 1897. This short publication of 11 pages is packed with detail documenting kindred, places, and dates! This great reference may feature rare genealogical information not found elsewhere! Price $6.95 USD. Soverhill Family History and Genealogy or Genealogy of the Soverhill Family. PDF eBook English 2.80 MB. 1910. Saved from the ravages of time this publication covers Soverhill descendants from 1800 to 1909! There is an alphabetical index which contains over 400 names of family members for this time period. 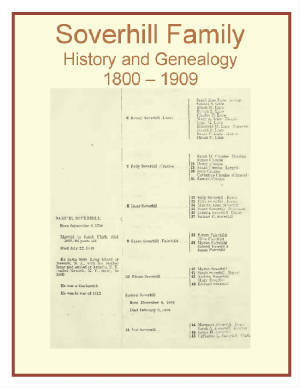 A great publication for the family genealogist with a wealth of kindred information! Price $6.95 USD. 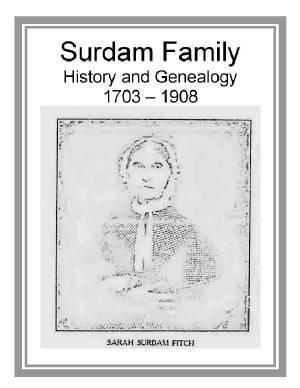 Surdam Family History and Genealogy or Genealogy of the Surdam Family. PDF eBook English 16.0 MB. 1909. Short biographies of many Surdam family members are contained in this publication which spans over 200 years, from 1703 to 1908. The photographs are very faded, but the text of the genealogical record is clear, and contains a treasure of information for the family genealogist! Price $6.95 USD. Tracy Family History and Genealogy or Genealogy of the Family of Lt. Thomas Tracy. PDF eBook English 7.84 MB 1889. 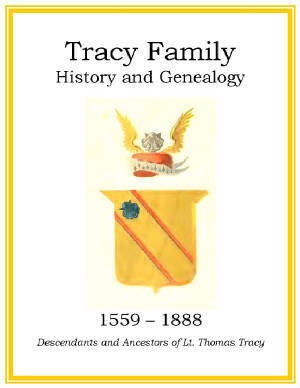 This excellent history of the Tracy family discusses the family origins that date back to the year 956, and the lineage of ancient days that came from Tewksbury, 10 miles northeast of Gloucester, England. In the early American Colonies bargaining with the Mohegan Chiefs in 1659 is detailed; the Coat of Arms for the Tracy and Allen Families is included; unique ancestral letters; and vital dates on descendants that range from the year 1559 up to 1888 are provided. A compelling, well articulated, writing that should be with every descendant interested in family genealogy! Price $6.95 USD.